De Quervain's tenosynovitis (or de Quervain tenosynovitis) is caused by stenosing tenosynovitis of the first dorsal compartment of the wrist. The first dorsal compartment at the wrist includes the tendons of the abductor pollicis longus (APL) and the extensor pollicis brevis (EPB). Patients with this condition usually report pain at the dorsolateral aspect of the wrist, with referral of pain toward the thumb and/or the lateral forearm. This condition responds well to nonsurgical treatment. [1, 2, 3, 4, 5, 6] See the images below. 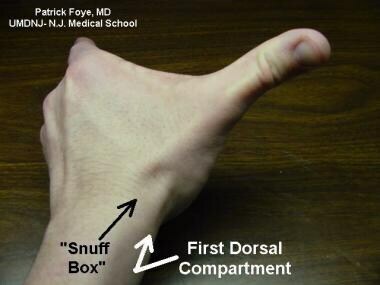 The first dorsal compartment of the wrist includes the tendon sheath that encloses the abductor pollicis longus and the extensor pollicis brevis tendons at the lateral border of the anatomic snuffbox. The Finkelstein test is performed by having the patient make a fist with the thumb inside the fingers. 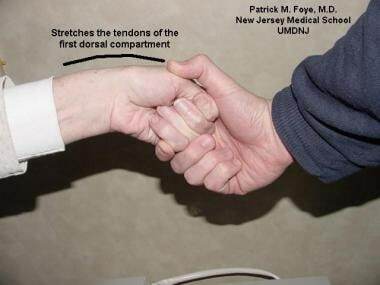 The clinician then applies ulnar deviation of the wrist to reproduce the presenting symptoms of dorsolateral wrist pain. Mortality is not associated with de Quervain tenosynovitis. Some morbidity may result as the patient experiences progressive pain, with limitations occurring in activities requiring use of the affected hand. De Quervain tenosynovitis is much more common in adults than in children. Breen TF. Wrist and hand. Steinberg GG, Akins CM, Baran DT. Orthopaedics in Primary Care. 3rd ed. Philadelphia, Pa: Lippincott Williams & Wilkins; 1999. 99-138. Brinker MR, Miller MD. The adult wrist. Fundamentals of Orthopaedics. Philadelphia, Pa: WB Saunders; 1999. 179-95. McGee DJ. Forearm, wrist, and hand. Orthopedic Physical Assessment. 2nd ed. Philadelphia, Pa: WB Saunders; 1992. 198-215. Snider RK. Hand and wrist. Snider RK, ed. Essentials of Musculoskeletal Care. Rosemont, Ill: American Academy of Orthopaedic Surgeons; 1997. 160-263. Strakowski JA, Wiand JW, Johnson EW. Upper limb musculoskeletal pain syndromes. Braddom RL, ed. Physical Medicine and Rehabilitation. Philadelphia, Pa: WB Saunders; 1996. 756-82. Ilyas AM, Ast M, Schaffer AA, et al. De quervain tenosynovitis of the wrist. J Am Acad Orthop Surg. 2007 Dec. 15(12):757-64. [Medline]. Gao ZY, Tao H, Xu H, Xue JQ, Ou-Yang Y, Wu JX. A novel classification of the anatomical variations of the first extensor compartment. Medicine (Baltimore). 2017 Sep. 96 (35):e7875. [Medline]. [Full Text]. Schned ES. DeQuervain tenosynovitis in pregnant and postpartum women. Obstet Gynecol. 1986 Sep. 68(3):411-4. [Medline]. Kim SK, Ahmed MA, Avins AL, Ioannidis JPA. A Genetic Marker Associated with De Quervain's Tenosynovitis. Int J Sports Med. 2017 Nov. 38 (12):942-8. [Medline]. Forget N, Piotte F, Arsenault J, et al. Bilateral thumb's active range of motion and strength in de Quervain's disease: comparison with a normal sample. J Hand Ther. 2008 Jul-Sep. 21(3):276-84; quiz 285. [Medline]. Goubau JF, Goubau L, Van Tongel A, Van Hoonacker P, Kerckhove D, Berghs B. The wrist hyperflexion and abduction of the thumb (WHAT) test: a more specific and sensitive test to diagnose de Quervain tenosynovitis than the Eichhoff's Test. J Hand Surg Eur Vol. 2014 Mar. 39(3):286-92. [Medline]. Lutsky K, Kim N, Medina J, Maltenfort M, Beredjiklian PK. Hand Dominance and Common Hand Conditions. Orthopedics. 2016 Mar 17. 1-5. [Medline]. Batteson R, Hammond A, Burke F, et al. The de Quervain's screening tool: validity and reliability of a measure to support clinical diagnosis and management. Musculoskeletal Care. 2008 Sep. 6(3):168-80. [Medline]. Hanlon DP, Luellen JR. Intersection syndrome: a case report and review of the literature. J Emerg Med. 1999 Nov-Dec. 17(6):969-71. [Medline]. Glajchen N, Schweitzer M. MRI features in de Quervain's tenosynovitis of the wrist. Skeletal Radiol. 1996 Jan. 25(1):63-5. [Medline]. Kwon BC, Choi SJ, Koh SH, Shin DJ, Baek GH. Sonographic Identification of the intracompartmental septum in de Quervain's disease. Clin Orthop Relat Res. 2010 Aug. 468(8):2129-34. [Medline]. McDermott JD, Ilyas AM, Nazarian LN, Keinberry CF. Ultrasound-guided injections for de Quervain’s tenosynovitis. Clin Orthop Relat Res. Jul 2012. 470(7):1925-31. [Medline]. Diop AN, Ba-Diop S, Sane JC, et al. [Role of US in the management of de Quervain's tenosynovitis: review of 22 cases]. J Radiol. 2008 Sep. 89(9 Pt 1):1081-4. [Medline]. Lennard TA. Fundamentals of procedural care. Lennard TA, ed. Physiatric Procedures in Clinical Practice. Philadelphia, Pa: Hanley & Belfus; 1995. 1-13. Goel R, Abzug JM. de Quervain's tenosynovitis: a review of the rehabilitative options. Hand (N Y). 2015 Mar. 10 (1):1-5. [Medline]. [Full Text]. Robson AJ, See MS, Ellis H. Applied anatomy of the superficial branch of the radial nerve. Clin Anat. 2008 Jan. 21(1):38-45. [Medline]. Garçon JJ, Charruau B, Marteau E, Laulan J, Bacle G. Results of surgical treatment of De Quervain's tenosynovitis: 80 cases with a mean follow-up of 9.5 years. Orthop Traumatol Surg Res. 2018 Jun 14. [Medline]. Scheller A, Schuh R, Honle W, et al. Long-term results of surgical release of de Quervain's stenosing tenosynovitis. Int Orthop. 2009 Oct. 33(5):1301-3. [Medline]. Richie CA 3rd, Briner WW Jr. Corticosteroid injection for treatment of de Quervain's tenosynovitis: a pooled quantitative literature evaluation. J Am Board Fam Pract. 2003 Mar-Apr. 16(2):102-6. [Medline]. [Full Text]. Mehdinasab SA, Alemohammad SA. Methylprednisolone acetate injection plus casting versus casting alone for the treatment of de Quervain’s tenosynovitis. Arch Iran Med. Jul 2010. 13(4):270-4. [Medline]. Huisstede BM, Gladdines S, Randsdorp MS, Koes BW. Effectiveness of Conservative, Surgical, and Postsurgical Interventions for Trigger Finger, Dupuytren Disease, and De Quervain Disease: A Systematic Review. Arch Phys Med Rehabil. 2017 Aug 30. [Medline]. Geiringer SR. Tendon sheath and insertion injections. Lennard TA, ed. Physiatric Procedures in Clinical Practice. Philadelphia, Pa: Hanley & Belfus; 1995. 44-8. Goldfarb CA, Gelberman RH, McKeon K, et al. Extra-articular steroid injection: early patient response and the incidence of flare reaction. J Hand Surg [Am]. 2007 Dec. 32(10):1513-20. [Medline]. Sawaizumi T, Nanno M, Ito H. De Quervain's disease: efficacy of intra-sheath triamcinolone injection. Int Orthop. 2007 Apr. 31(2):265-8. [Medline]. [Full Text]. Pagonis T, Ditsios K, Toli P, Givissis P, Christodoulou A. Improved corticosteroid treatment of recalcitrant de Quervain tenosynovitis with a novel 4-point injection technique. Am J Sports Med. Feb 2011. 39(2):398-403. [Medline]. Apimonbutr P, Budhraja N. Suprafibrous injection with corticosteroid in de Quervain's disease. J Med Assoc Thai. 2003 Mar. 86(3):232-7. [Medline]. Lapegue F, Andre A, Pasquier Bernachot E, et al. US-guided percutaneous release of the first extensor tendon compartment using a 21-gauge needle in de Quervain's disease: a prospective study of 35 cases. Eur Radiol. 2018 Apr 4. [Medline]. Kang JW, Park JW, Lee SH, et al. Ultrasound-guided injection for De Quervain's disease: accuracy and its influenceable anatomical variances in first extensor compartment of fresh cadaver wrists. J Orthop Sci. 2017 Mar. 22 (2):270-4. [Medline]. Venkatesan P, Fangman WL. Linear hypopigmentation and cutaneous atrophy following intra-articular steroid injections for de Quervain's tendonitis. J Drugs Dermatol. 2009 May. 8(5):492-3. [Medline]. Chodoroff G, Honet JC. Cheiralgia paresthetica and linear atrophy as a complication of local steroid injection. Arch Phys Med Rehabil. 1985 Sep. 66(9):637-9. [Medline]. Green SM. Nonsteroidal anti-inflammatories. Tarascon Pocket Pharmacopoeia 2000. Loma Linda, Calif: Tarascon Pub; 2000. 2000:11-2. Cavaleri R, Schabrun SM, Te M, Chipchase LS. Hand therapy versus corticosteroid injections in the treatment of de Quervain's disease: a systematic review and meta-analysis. J Hand Ther. 2016 Jan-Mar. 29 (1):3-11. [Medline]. Disclosure: Serve(d) as a speaker or a member of a speakers bureau for: Ossur, Fidia.